On October 30, 2018 at 12:00pm (Eastern Time), join us for a free webinar with U.S. tax attorney Alexey Manasuev, LL.M. (Int’l Tax), NYU, TEP, U.S. tax accountant Brandon Vucen, CPA, CA, CPA (IL), MST, and Jory Stern, B.A., J.D., who is both a U.S. and Canadian attorney. We will discuss the issues surrounding purchasing and selling U.S. real estate and the potential U.S. tax obligations. As most Canadians have experienced, the winters in our great white north tend to be a little chillier than we prefer. Because of this, we find a large number of our clients enjoy spending the winter months taking advantage of the sunnier weather bestowed upon some of our neighbors to the south. In doing so, clients oftentimes run into tax issues, whether it be purchasing property, renting property or overstaying their welcome (by exceeding the number of days allowed) and subjecting themselves to tax filing requirements in the United States. 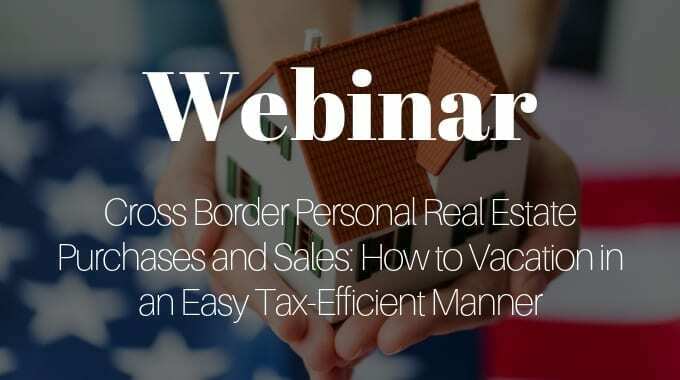 This webinar will provide an overview of the purchasing and selling process, various issues to look out for when engaging a real estate company and helpful information about staying onside with the U.S. tax system. To learn more, please register and gain the insights you need to open the dialogue for you and your clients to effectively manage their tax exposure when purchasing property or traveling in the United States. We hope you join us!